After college and having found a real job I discovered I had a little extra spending money. 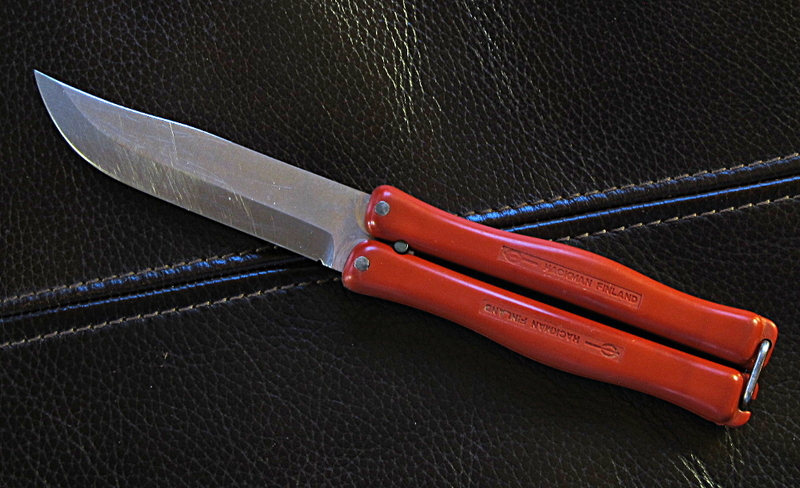 I was entranced by a red handled folding knife that could be best described as a butterfly knife from Finland. Of course I satisfied that itch. The blade doesn’t have a tang stamp and the only identification is “Hackman Finland” molded into the red plastic handle. The 3.75 inch blade is a saber grind with a small secondary bevel that forms the actual cutting edge. The blade is an unknown stainless steel. I’ve had it for years and no evidence of rust has appeared, despite the minima care I’ve given it. And the plastic has also held up quite nicely. I filed a small choil in the blade to separate the edge from the ricasso. It was thought, with some justification, that without the choil you would damage your sharpening stone by chipping away it’s edge. In retrospect I realize was all I really accomplished was to add a stress riser in the blade. Hackman was a cutlery and cookware company founded in Finland in 1790. Later it was bought by the Iittala Group. In 2007, littala was swallowed by the Fiskars Corporation. Fiskars never, in my opinion, understood the American knife market and even now needs to make up for lost ground. 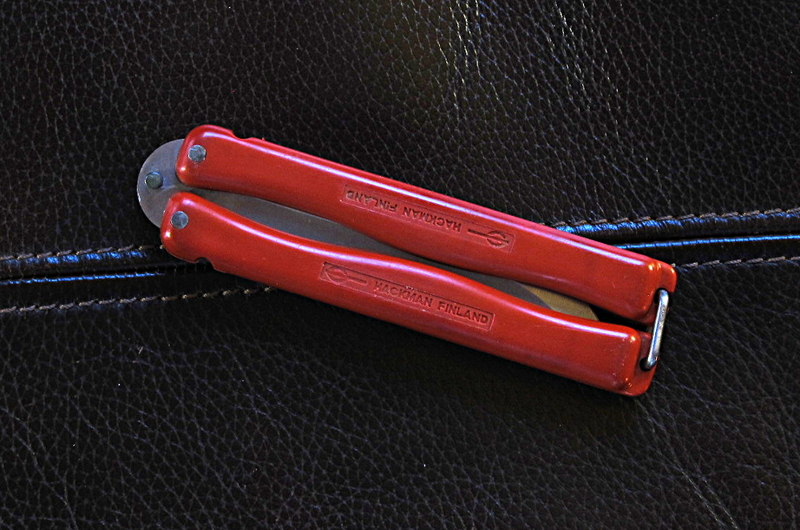 The Hackman butterfly knife was better known in Finland as Linkkupuukko, or “latch-knife”. The marketing boys positioned it as a retkiveitsi or “camping knife” and later as Eräpuukko or “wilderness puukko.” By now you should associating puukko with Finnish for knife. The Hackman story begins when Johan Friedrich Hackman was awarded the right to establish a trading house in the Hanseatic city of Vyborg. He soon had a successful timber goods business on his hands, but like most businessmen he sought out new opportunities. West of him was the territory now known as Finland. In the early 1800s Hackman bought Sorsakoski – a small factory community in eastern Finland. The purchase included a sawmill, flourmill and a brick factory. Hackman’s cutlery business began in nearby Vyborg in 1876, headed by his son also Johan Friedrich Hackman. Junior moved their entire cutlery manufacturing business to Sorsakoski in the early 1890s. The factory community was a mirror of Finnish society at the beginning of the twentieth century. Companies like Hackman took full responsibility for providing basic services to their employees. Sounds a little like the American coal mining companies and the company store, doesn’t it? In 1902 Hackman began manufacturing new low-cost cutlery items forged from a single workpiece. The introduction of quality stainless steel in the 1920s revolutionized the entire cutlery business. By the 1960s design legends like Kaj Franck and Bertel Gardberg had designed iconic cutlery collections for Hackman. The black handle version of the knife seems to have a sordid past or excellent present day marketing. There are rumors, highly unsubstantiated rumors, that CIA agents were issued the knife for Vietnam. If anyone has any real knowledge I’d sure like to hear from you. This makes some limited sense. The knife isn’t made in the USA and being caught with one might not brand you as an imperialistic agent. The mechanism is simple and robust, perhaps perfect for undercover work. Being inexpensive, ditching the knife if you were being followed or mouse-trapped didn’t require a huge sacrifice on your part. However, it isn’t likely you can call up the CIA and speak to the quartermaster and expect to get a straight answer. That’s where the marketing comes in. It’s easy to say on ebay that the knife is from the CIA / Vietnam issue era. There’s a story here and perhaps one day we’ll know it in its entirety.